My overnight at Te Anau was at Te Anau Hotel and Villas, a comfortable resort whose rooms featured floor-to-ceiling windows looking on to Te Anau Lake, right across the street. In contrast to bustling Queenstown, Te Anau is quiet, with a distinct laid-back feel. There aren’t the number of attractions that Queenstown has, but it’s the perfect place to take it easy for a day or two. And, it’s a great way to break up the four hour (each way) trip from Queenstown to Milford Sound. And, if you’re a fan of Manuka honey, the plant from which it’s derived, lines part of the shore line of Lake Te Anau. For breakfast I walked over to Mostly Pie, a small take out bakery with tables in front, where I dined al fresco on a fresh scone and coffee, prior to boarding my “Great Sights” motorcoach to Fiordland and Milford Sound. The route to Milford goes through Fiordland National Park, with its spectacular vistas of jagged mountains, ribbon-like waterfalls, and tropical vegetation. The coach made several stops, allowing passengers to photograph the sites, and, at one point, to take a short stroll along a fern-lined nature trail. 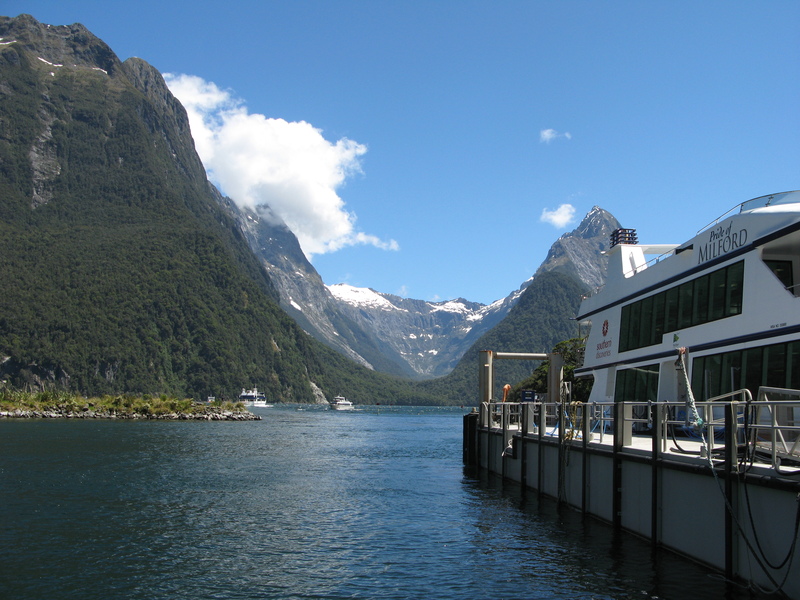 Arriving at the Milford Sound Dock, I boarded my assigned boat, where the cruise began with a pre-paid buffet lunch. Travelers can purchase their own food prior to boarding, or sign up for the onboard lunch. The food was ordinary, but lunch onboard proved convenient. 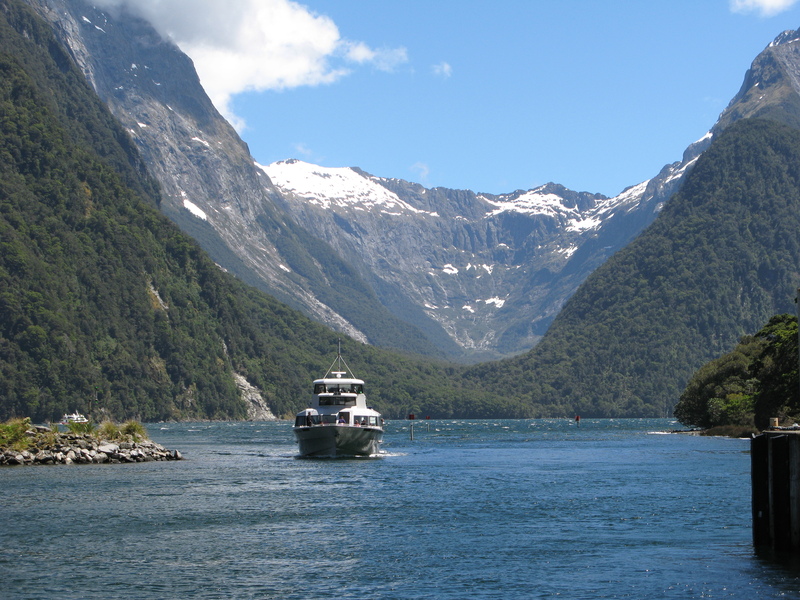 While the cruise itself didn’t disappoint, for some reason I had expected the Milford Sound to be larger. The cruise itself took under 2 hours, but the scenery was stunning. Sailing along a fiord-lined passage with cone-tipped tropical mountains spilling to the sea, some with waterfalls, was a truly memorable experience, and one of my trip highlights. It truly was one of those “once in a lifetime” sights you have to see. Following the cruise, Goway, which had arranged my trip, reserved my motor coach transport back to Queensland and the Heritage Hotel, where I would spend the night prior to leaving for Mt. Cook. The four-hour ride back to Queenstown was a bucolic sea of green, providing relaxing vistas of verdant meadows and sheep grazing in fields.